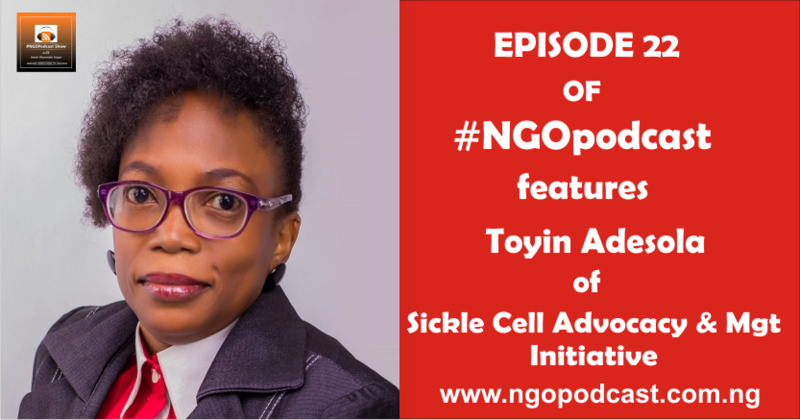 The Episode 22 of NGOpodcast features Toyin Adesola, the Founder of Sickle Cell Advocacy & Mgt Initiative, A Nigerian – based Nongovernmental organization that focuses on advocating and provide support for sickle cell patients to live optimal and productive lives. The vision of the organization is to have a nation where Sickle Cell Disorder (SCD) is reduced and people with sickle cell as well as their families are able to live healthy, positive and productive lives. The mission of the organization is to empower and improve the lives of people, especially with SCD through strategic partnership by educating, creating awareness, and providing support. On this episode, Toyin Adesola shared her story with us, why she started her organization and of course she educate us about sickle cell and its cause, You should listen to this. Enjoy the interview with her!